Despite that the technology of docker itself is really mature now, it’s just too new that a lot of learning materials are just messy. And many items you found from Google are actually not consistent. I would try to sort out those messy concepts (a little bit) here. You may treat docker as some kinds of very light-weight virtual instances. It’s so light that, it even shares the same Linux kernel with the host machine. Inside the docker container, the kernel version must be the same as the one of host machine. Docker container is actually smaller than similar virtual instances (compared to VirtualBox and VMWare), because it saved the disk space for the Linux kernel. Docker used a lot of functionalities of Linux kernel (e.g. name space), so it only works with Linux kernel of version 3.10+. Actually docker could be installed on Windows and Mac. But in those cases, a mini-instance of VirtualBox Linux would also be installed so as to provide the required kernel. Guest and host file systems are both separated. For example, command ls /home on docker container would have a different result than on the host machine. Processes are separated. For example, ‘ps -a’ in the docker container would not show the processes of the host machine. Network interfaces and ports are bridged / tunneled from the host machine, just like VirutalBox or VMWare. You cannot get the UI from docker easily. Though there are some tricks to do that, the performance is not satisfactory in general. There is not actual boot process of the docker container, i.e. the init processes of ssh, crontab and etc. are not automatically executed during the start of docker. You can only run one persistent process inside one docker. You could, however, use some tricks like superevisord to start multiple a long-running process. You must use root permission to execute the docker related commands. Super light, a basic instance of Ubuntu may occupy about 100MB. The size is even smaller for Debian. It’s much smaller than the fresh installation of VirtualBox and VMWare. You could create images for docker containers very easily. The images are like the snapshots of VirtualBox/VMWare, except they are super light and super fast. You could push the docker images to docker repositories using git like tools. And you could pull them down from other machines right away. You could define configurations of docker (DockerFile) that would simply define steps to create a new image. That makes sharing of Linux environment much easier. I believe the killer application of docker should be deployment. It basically wraps all configuration details into one image file, that could be pushed and pulled along different machines easily. So people do not need to setup the environment (and get stuck with compilation errors) again and again. My gut feeling is, docker would make Ubuntu even more popular than ever, the operating system is even more lightweight than before. People could create and destroy an OS configuration in a wink, just like software development debug cycles. Since I mainly used python (and Django) for the development, virtualenv is actually another ‘similar’ option for encapsulation. However, the biggest problem with virtualenv is that it’s too high level (because the tool itself is python-based). Some libraries like lxml and PIL are just wrappers of C libraries, and hence they could not be embedded into the virtualenv environment. You could now play inside the docker container now. 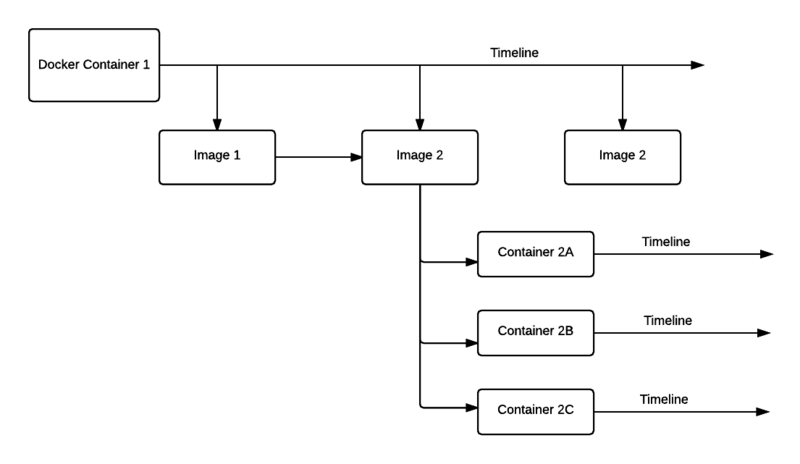 The relationship between container and image is a little bit like VirtualBox instance and snapshot. You could take snapshots for the VirtualBox instance at a different time. Similarly, you could make a snapshot for the container at a different time. However there is a subtle difference, you could also activate multiple dockers images of the container at the same time (to have multiple instances as a result), but you can hardly do that for VirtualBox. So I guess a more accurate analogy would be git branch and tag. Each branch could be easily tagged, and each tag could introduce a new branch. Note that the repository you committed to may not be the same as the one you pulled from. For example, you may pull ubuntu:14.04 from a public repository, and want to push to your own private repository. The most important part of any virtual instance, is that it could be easily cloned and migrated. And it’s particularly easy for Docker. This is the most raw way to clone out the image, and it has no dependency of any repository server. Note that a free user could only host 1 private project on DockerHub. You have 3 options if you want to push images of more than one project: 1. Pay DockerHub for more private project slots 2. Open source your projects, and make them public. Docker hub has no limitation on the public projects. 3. Set up your own private repository. I should talk more about the set up of a private repository, DockerFile and docker compose in a separate blog post.